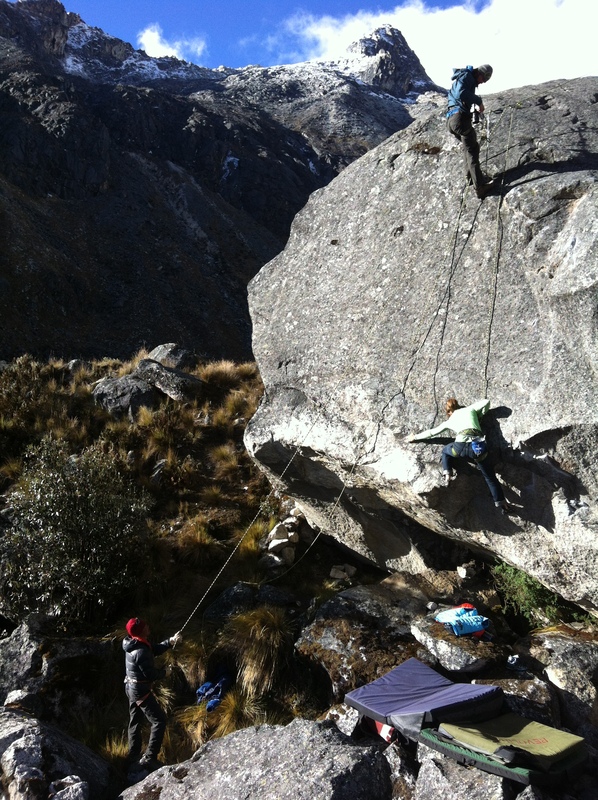 I guess it’s time I write about the bouldering in Peru. This was my second bouldering trip (ever) and the goal was to locate, scrub, chalk, and climb untouched boulders. I’ve had just about as much experience cleaning boulders as I’ve had with crampons, so we’ll just say I didn’t have a clue what was going on. But I’m a quick learner! After climbing through the crux and headwall of my first cleaned boulder, I reached the top out only to find non holds covered in dirt and moss. From my fixed line, the top out holds had looked juggy, so I figured, “why waste the time cleaning off a bunch of moss that won’t really be an obstacle anyway?” I was wrong. Always clean the moss off. And the dirt. All of it. Even when you think there isn’t anything left to scrub away, keep scrubbing. There’s always more dirt, and it will force you to down-climb the entire boulder back to the ground so that you can go back up on a rope, brush off the top out holds, then rescrub the rest of the holds that the top moss just fell on, and then try again. Do it right the first time. Since I’m not much for giving the play by play on climbing sequences, especially when we put up first ascents in an area to which very few people will return, I’ll stick with the experience of developing a few of my favorite lines. The Radiance was the first boulder I saw that immediately drew me in. Moderately tall, wonderfully illuminated by the light of sunset, and littered with just enough crimps up lock off spaced rails, this route fit my style perfectly. Unfortunately, this was one of the boulders that I neglected to clean the top out. Whoops. On to the next. 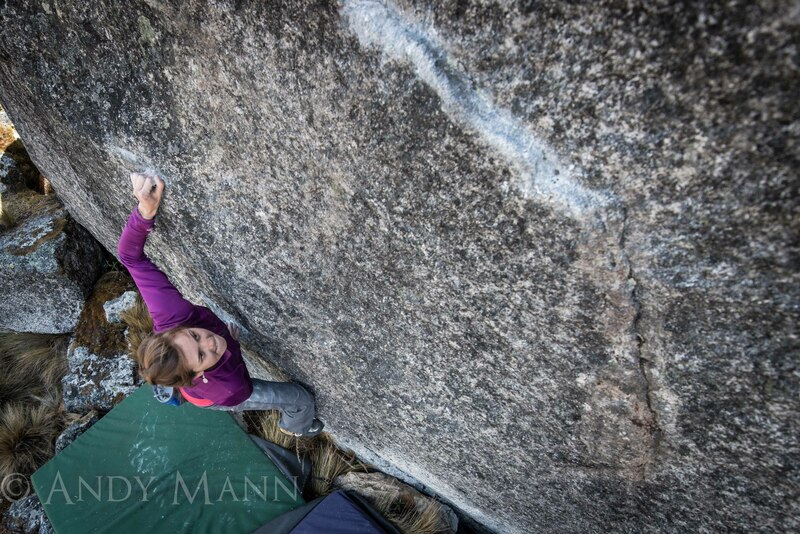 Fern Gully was perhaps the most physically challenging boulder I put up. With slopey holds and big compression moves, this actually required bouldering. As hard as I tried to drop knee and static my way through the crux, there was no way around the mandatory pounce and toe hook. 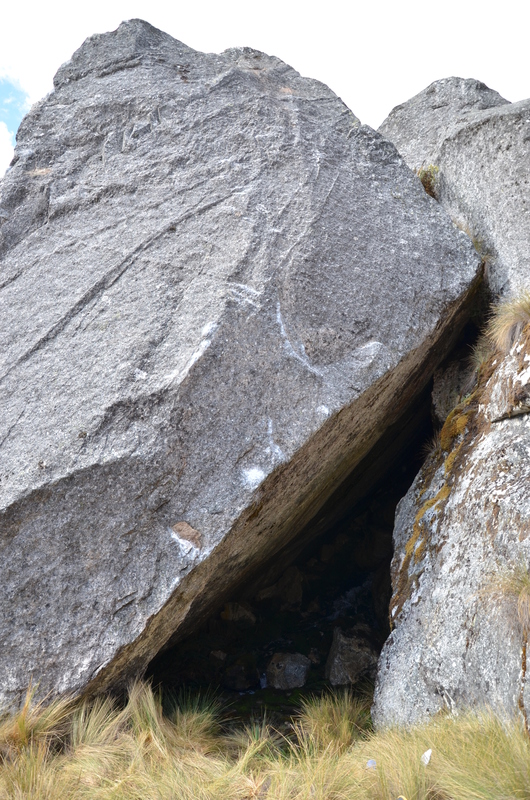 The crux off the start creates a wishbone formation, which leads to a sustained but straightforward slab. The waterfall cave behind the problem is what originally caught my eye, motivating me to try the boulder. 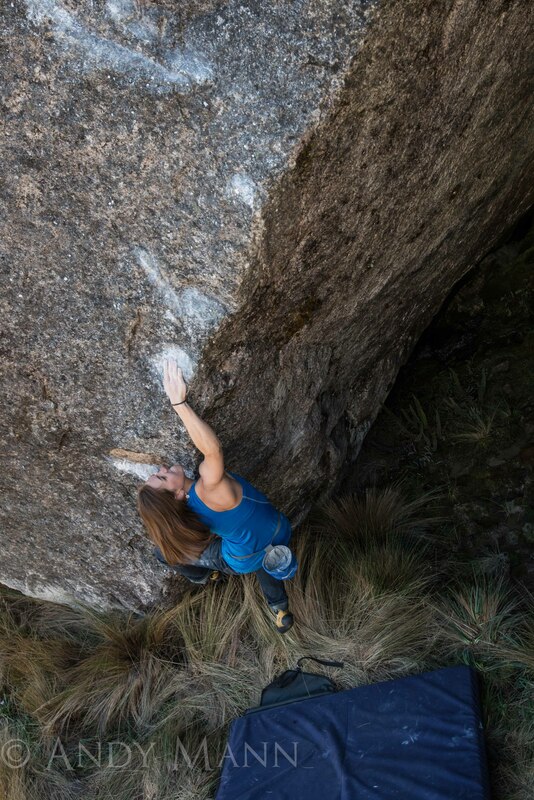 I’m only able to put 100% of my effort into a project when I feel passionate about the route – basically, it just needs to be aesthetic and fun to climb. Fern Gully was the first boulder I’ve ever felt excited about. Although the moves were difficult for me, and not fitting to my strengths, I wanted to climb this waterfall border, and so I tried. I tried hard enough to make noises. And I finished it. In my final week at basecamp, I completed a problem I called Five Dog Night. 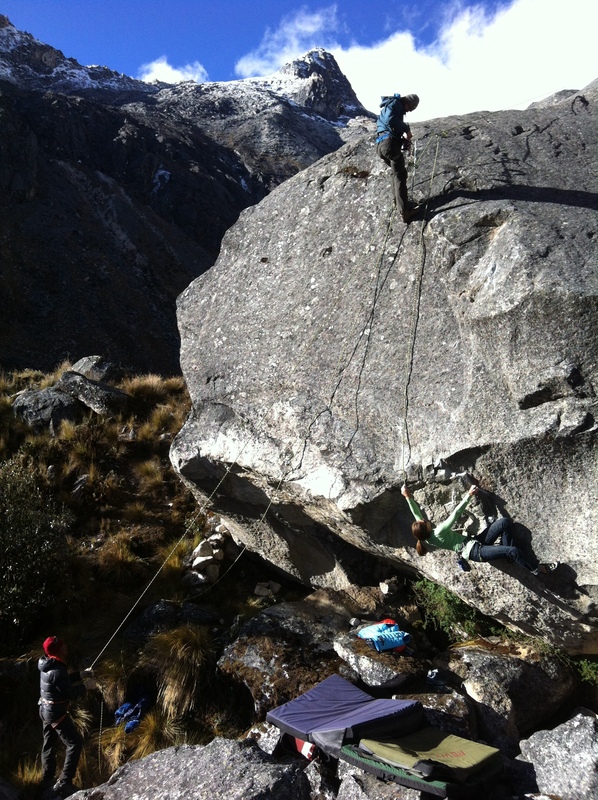 This massive boulder served as the mantle piece to our basecamp, looming over our tents, begging to be climbed. Andy Mann cleaned the line and passed it off to me when I expressed an interest in working it. I’m not sure what drew me in. The landing was horrendous, the fall scary and uncontrollable, and the crux unstable. A steep face led to a mantle which spits you into a Yosemite like slab with nonexistent holds, insecure feet, and technical movements. Even after practicing the moves over and over on top rope, I felt that a foot could blow off at any moment, sending me spilling to the ground. On my first actual bouldering attempt, I knew that I had one shot, and one shot only. If I mantled up, allowed myself to panic, and backed off, I would create a mental crux that would be challenging to overcome. If I fell, it would probably hurt. So, I mantled up, pressed my body against the slab, and stood still for a few minutes, saying a short prayer that I would glide safely and fearlessly up the boulder. And so it went. Developing first ascents was an eye opening experience. Exhilarating, yes. Stressful, a bit. Rewarding, certainly. But most importantly, what I learned from this whole cleaning a boulder thing, is that I want to bolt a route. I can’t even imagine the gratification (and frustration) of finding, planning, cleaning, and bolting a line three or four or ten times the size of a boulder. Now all I need is a drill!